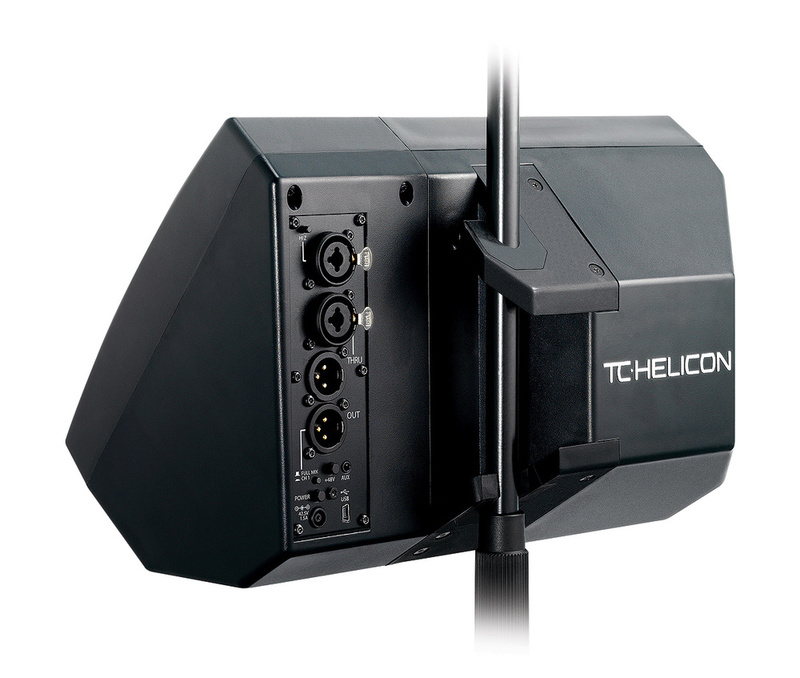 This compact monitor combines Tannoy speaker technology with TC Helicon's renowned reverb and vocal processing. Billed as personal PA, vocal monitor, instrument amplifier and vocal reverb unit, the TC Helicon VoiceSolo FX150 is essentially a mini monitor, weighing just 3kg, with built‑in DSP for mixing and effects. Its compact form (210 x 286 x 184 mm) houses a 6.5‑inch, Tannoy ICT Dual Concentric driver, which is protected by a perforated steel grille and driven by 150W of Class‑D amplification. Powered from an external, universal‑voltage PSU (pretty much the only aspect of the design I don't like) with a continuous power rating of around 60W, the polystyrene case is shaped to act as a floor wedge or, by means of the rubbery 'Easy Grip' rear section with its two opposing slots, it can hang securely on a mic stand. No tools or adaptors are required so setup is very fast, though if you do want to have the FX150 set up conventionally on top of a stand, there is an adaptor included that fits into one end of the case meaning the speaker will be mounted sideways on. This doesn't affect the sound, of course, as dual‑concentric speakers act as a point source and so behave the same in any orientation. The front panel functions as a three‑channel mixer and is dominated by a series of white back‑lit buttons, a master volume control and a data knob with indicator LEDs around it. If a channel does not have an input connected, its lights glow more dimly. The controls are used for setting levels, adjusting the reverb and tweaking the three‑band EQ, and the currently active level or EQ button shows blue so you always know what you are adjusting. The first two channels have mic/line inputs on 'combi' connectors, on which the use of a jack automatically switches the input to line sensitivity. Channel one's jack input is also designed with a high impedance so that it can double as an instrument input. TC Helicon's 'intelligent' Vocal Tone processing has its own on/off button and combines voicing, compression, de‑essing and gating, all designed to adapt automatically to the input signal. This is not variable in intensity but is influenced to some degree by the main EQ controls. In monitoring applications, adding any compression increases the risk of feedback, but if this becomes a problem it can be switched off, leaving you with just the EQ to shape your sound. I found the Tone button robbed the sound of a lot of low end, presumably to compensate for the proximity effect of cardioid‑pattern mics used close to the mouth. I mentioned the feedback issue to the TC design team and they are already looking into a firmware update to get around this problem. Nine different reverb styles are on offer, with independently variable amounts for the two mic/line channels. While this may seem extravagant for a stage monitor, remember that the FX150 can also be used as a mini PA, an acoustic guitar/mic amplifier or an extension to an existing system. You can select from the reverb types using the Style button and data knob, and the presets range from a small bright room, via a plate, to a large stadium. The third channel is fed from a 3.5mm stereo mini-jack, and has a similar control layout, with the exception that the Vocal Tone EQ button is replaced by one marked Voice Cancel, which is a centre‑cancel option intended to reduce the vocal level in a backing track for sing‑along applications. This channel might be used as an input from an MP3 player or similar, but with the right adaptor cable it could also be used as an extra mixer input for a modelling guitar preamp. Both of the mic inputs can have phantom power applied by means of a global switch on the rear panel, which also houses the two mic/line inputs, a thru XLR for channel two, and a main output that can be switched to carry the full mix (including the aux input and any added effects) or the output of channel one only. The PSU also connects here, and there's a small power button along with a mini USB port, which is provided for firmware updates. Adjustment is very intuitive and simply involves pressing the button for the level or parameter you want to adjust, then using the Edit knob to make the adjustment. One unique feature is something TC Helicon call 'Mic Control'. This allows the reverb to be bypassed remotely, using the switch on either a TC Helicon MP75 or Sennheiser e835 FX microphone. To enable Mic Control on either channel, it is necessary only to press and hold the Reverb Level button on the front panel for five seconds. There's little need to read the instructions to get started, though the single‑sheet, multi‑language quick-start sheet that comes with the FX150 can be read through in under a minute. Nevertheless, it is worth looking up the full manual online as there are a couple of hidden functions that you may find useful, such as the ability to use the back‑lit buttons as level metering for the channel one input. As expected, the sound quality doesn't disappoint, with both clarity and level living up to expectations — in monitor applications you'll run into feedback well before you run out of monitor level. If you overcook the input level, the Vocal Tone button will flash red as a warning. The reverbs sound pretty good (though you need to keep the level dialled back as it can quickly become excessive), and is also a useful EQ range. Switching in the Vocal Tone brightens up the sound in a pleasing way, and also scoops the mids slightly, but does also make feedback more likely. Most mini monitors incorporate low‑frequency roll‑off, often set as high as 200Hz, as this helps get more level out of the speaker without distortion, and in monitor applications the low‑end leakage from the PA fills in the bottom couple of octaves quite effectively. However, to enable the FX150 to handle stand‑alone roles, it has a slightly more extended low‑end response rolling off below around 150Hz and so manages to sound quite full for something so small. The 'Easy Grip' system allows the FX150 to be mounted on a mic stand.One of my tests involved taking the FX150 to a pub gig where we used it as an extension speaker fed from a Fishman acoustic guitar amp, which was also handling the vocals. It worked extremely well in this role as it provided good coverage but with very little sound projecting to the rear, which meant we could get plenty of level before feedback called a halt. It also works well as a mic‑stand monitor, as you can adjust the placement to send the sound exactly where it's needed. You have to be a bit careful with the master volume setting, of course, as the speaker will be very close to the microphone, but it is still surprising how high you can get the monitor level. Having reverb built into the monitor also helps and it means that you can use more of it if it helps you perform better without the reverb being sent on to the FOH system. TC are known for their high‑end reverb algorithms so it came as no surprise that these actually sound very good. It's certainly good enough that you may choose to use the onboard reverb as your main vocal effect and then send the effected vocal to the FOH mixer. The Mic Control option is also very useful if you have a compatible microphone to allow remote effect switching, while the flexibility of signal routing also makes it possible to combine your own effected vocal with a monitor mix coming from the desk, so you can set up a 'more me' mix very easily. In fact the only thing I felt uneasy with was the external PSU. I know why companies use these — it saves having to have the whole product re‑tested (at great expense) for different territories. I did enquire why the power supply couldn't be docked somehow, perhaps in a compartment moulded into the case, as that would allow it to be connected like a regular mains powered box, but apparently there are EU regulations that prohibit that too. Nevertheless, if I bought one of these, I'd definitely use some heavy duty Velcro to fix the PSU to the back of the case and then leave it there as there's plenty of flat surface to attach it to. To wrap things up then, TC Helicon have taken an existing concept, interpreted it very well, and then added the sort of functionality that you might not expect, such as reverb, centre cancelling on the aux input and the ability to control the reverb remotely from a compatible microphone via Mic Control. I feel that the Vocal Tone processing would have been more useful if it was variable in strength (and, in theory at least, a firmware update might make that possible if the TC Helicon engineers agree), so that it could be backed off when feedback threatens, but in all other respects the FX150 is a very effective, cleverly conceived little monitor with a number of useful applications. I've tested alternative mini monitors from Galaxy, Mackie and Wharfedale, all of which do what is required of them, but none of the others have built‑in reverb. Mounts easily on a mic stand. Built-in three‑band EQ, Voice Tone processing and a choice of reverbs. External PSU is less than ideal in a live situation — but there's always Velcro! 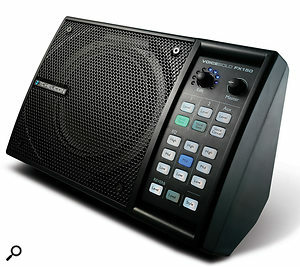 A great monitor that can double as a mini PA or extension speaker, with the added benefit of high‑quality reverb.